Carine Zanotti, charter manager at Yachting Partners International, has been appointed central agent for charter of the new 62m sailing yacht Athos. 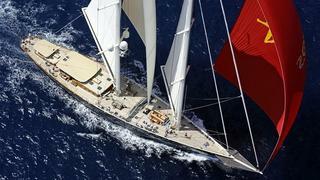 Designed by Andre Hoek Design and built by Holland Jachtbouw in 2010 to Bureau Veritas class and MCA compliant, Athos is the world’s largest privately-owned two masted schooner and the most technologically sophisticated classic sailing yacht to date. Her 11 metre beam creates an unprecedented amount of volume with an interior for 10 guests in an owners’ suite with private cockpit and deckhouse, four guest cabins and a main deckhouse with a formal dining and lounge area. Her three boarding platforms provide ideal landing possibilities for dinghies but also for a truly unique feature found only on board Athos, her FIB (Flying Inflatable Boat) which can be flown by guests with a flying licence. When it comes to other toys, guests will not find Athos lacking. She has no less than two Laser Vago sailing dinghies, two Optimist sailing dinghies, one custom 6.2m Naiad tender, one custom 5.3m Rib-X, three Wakeboards, dive gear for up to eight divers, water skis, inflatable toys, towables, a full range of fishing equipment and lots more, all discreetly stored in the yacht’s large deck lockers. Athos is available for charter in the Caribbean this winter at weekly rates from €180,000.